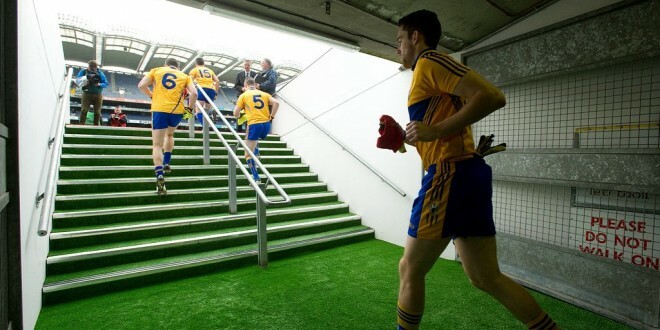 The Clare team head out on Croke park turf before the Division 4 League final against Tipperary in Croke Park. Photograph by John Kelly. 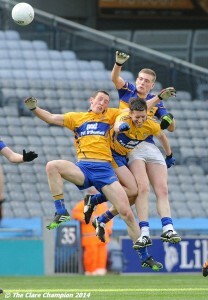 CLARE put in a brave, unyielding display in Saturday evenings NFL division 4 league final in Croke Park. Martin Oige Murphy and Martin Mc Mahon of Clare in action against Barry Grogan of Tipperary during the Division 4 League final in Croke Park. Photograph by John Kelly. The highlight was a magnificent goal, early in the second half from Kilmihil’s Martin O’Leary who was played in by fellow U/21 Jamie Malone. 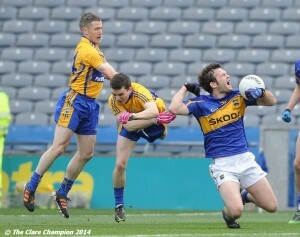 Shane Hickey and Gordon Kelly of Clare in action against Ian Fahey of Tipperary during the Division 4 League final in Croke Park. Photograph by John Kelly. At that stage Clare led 1-11 to 1-8 and backed by a strong wind, it looked as if their first appearance in Croke Park since 2004 would end in victory. 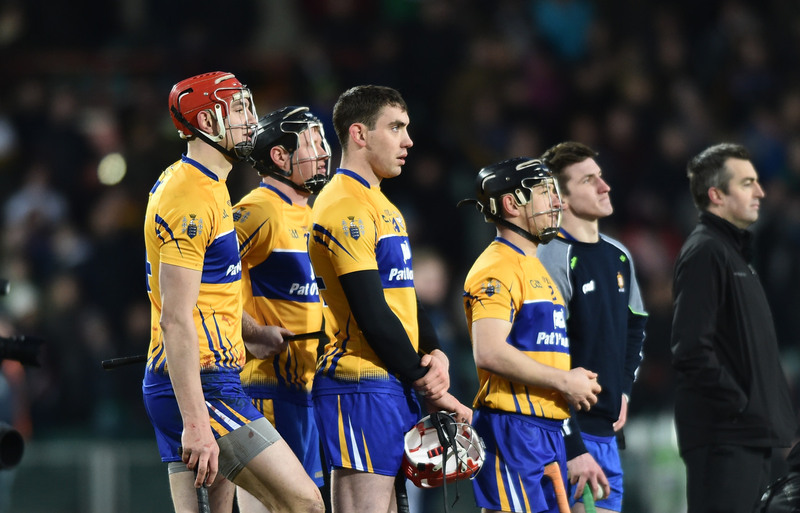 However they added just four points in the closing half hour with Tipperary tagging on 0-8 during the same spell. The game was watched by a crowd of 8,654 people. Conor Sweeney was the winners main man in attacking scoring their goal in the opening half and kicking an array of impressive points. Tipperary led 1-7 to 0-9 at half time, thanks to Sweeney’s 19th minute goal. In fact were it not for two excellent blocks from Kevin Hartnett, Tipperary could have scored at least one further first half goal. 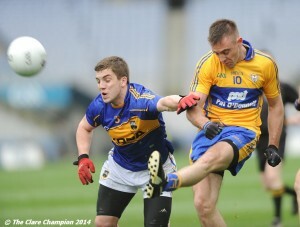 Shane Mc Grath of Clare in action against Philip Austin of Tipperary during the Division 4 League final in Croke Park. Photograph by John Kelly. 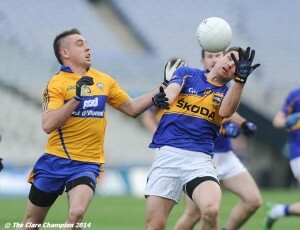 Shane Mc Grath of Clare in action against Robbie Kiely of Tipperary during the Division 4 League final in Croke Park. Photograph by John Kelly. 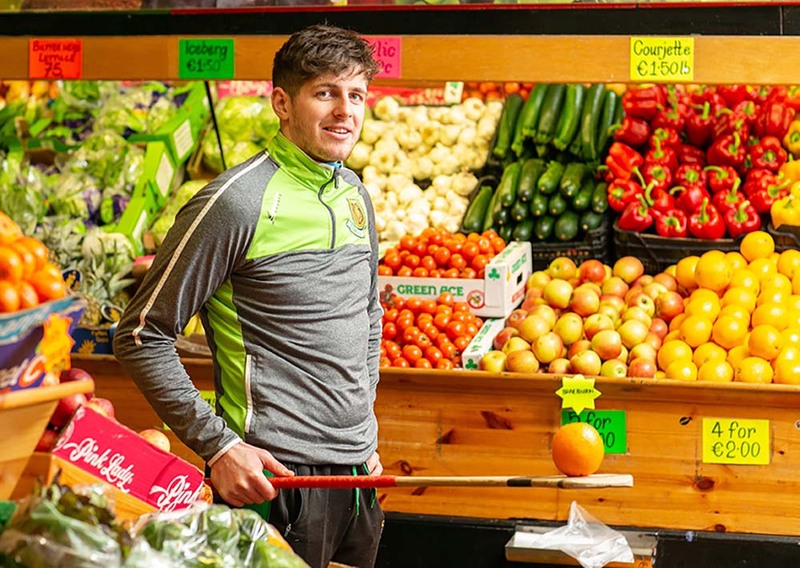 At the far end Shane McGrath kicked four magnificent first half points and while he kicked four wides in total, the Thomas Davis clubman showed his class on the big stage as did David Tubridy, who lit up GAA headquarters with some superb points from play. As the second half developed Clare gave away possession on a number of occasions while their discipline in the tackle also deteriorated as the game wore on. 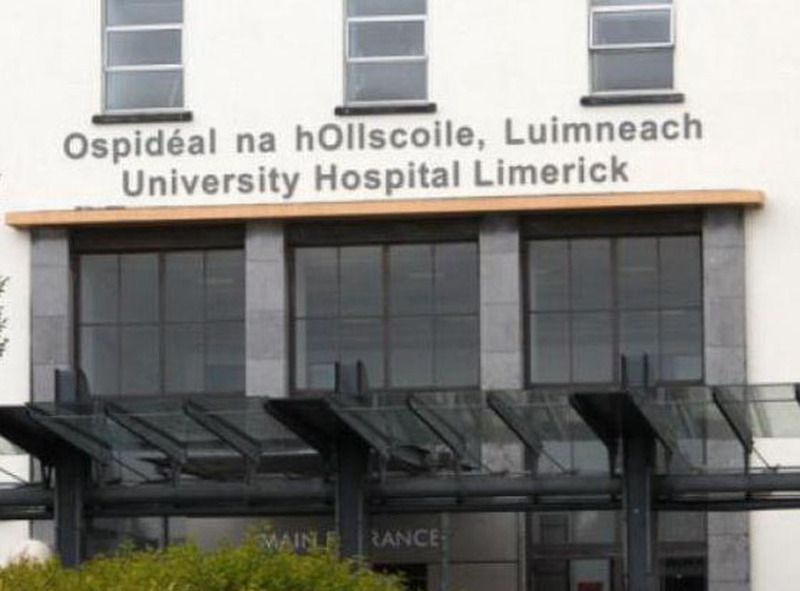 They lost Shane Hickey to injury in the second half, while Joe Hayes also replaced Pierce Deloughrey in goals midway through the second period. 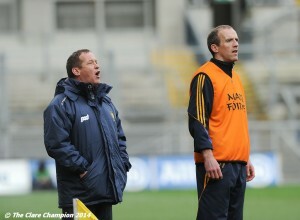 Clare manager Colm Collins and coach Paudie Kissane on the sideline during the Division 4 League final against Tipperary in Croke Park. Photograph by John Kelly. Speaking to The Clare Champion afterwards Clare manager Colm Collins said that the defeat was down to sometimes not sufficiently protecting the ball. “It’s disappointing to lose. I thought our lads played well and did a lot of very good things but we turned over the ball too much and we paid the price,” Collins said. “You’ve got to keep the ball against decent opposition and you don’t get away with things like that. So we’ve got plenty of things to work on before we play Waterford on June 8,” he added. 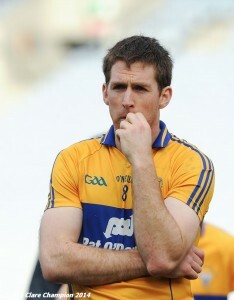 A dissapointed Clare captain Gary Brennan following the Division 4 League final against Tipperary in Croke Park. Photograph by John Kelly. 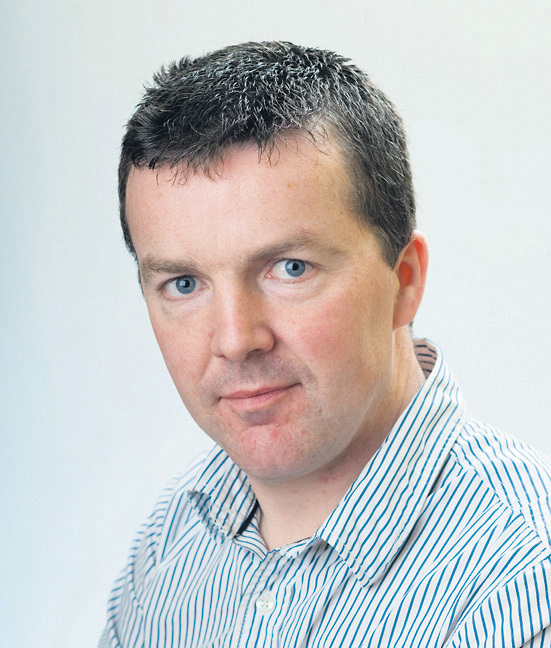 Clare: Pierce Deloughrey; Dean Ryan, Kevin Hartnett, Martin McMahon; Shane Hickey, Gordon Kelly, Enda Coughlan; Gary Brennan (captain), Cathal O’Connor; Shane McGrath, Jamie Malone, Ciaran Russell; Martin O’Leary, Shane Brennan, David Tubridy. Subs: Podge McMahon for Shane Brennan, Joe Hayes for Pierce Deloughrey, Rory Donnelly for Jamie Malone. Scorers: David Tubridy (0-7, 0-4f); Shane McGrath (0-4), Martin O’Leary (1-0), Cathal O’Connor, Shane Hickey, Jamie Malone, Cathal O’Connor (0-1 each). Tipperary: Paul Fitzgerald; John Coghlan, Paddy Codd (captain), Andrew Morrissey; Robbie Kiely, Peter Acheson, Donagh Leahy; Stephen O’Brien, George Hannigan; Philip Austin, Ian Fahey, Brian Fox; Conor Sweeney, Michael Quinlivan, Barry Grogan. Subs: Seamus Grogan for Philip Austin, Ciaran McDonald for Andrew Morrissey, Colin O’Riordan for Ian Fahey, Conal McCullagh for Seamus Grogan (Black card). Scorers: Conor Sweeney (1-8, 0-4f), Barry Grogan (0-4, 0-2f), Robbie Kiely, George Hannigan, Stephen O’Brien, Ian Fahey (0-1 each).